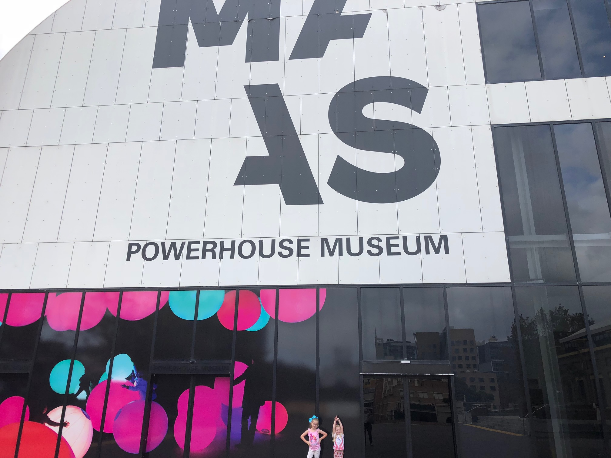 Future Park at Powerhouse Museum is in its final weeks before it moves out of Australia and it’s an absolute must see with the kids especially if you’re looking for a fun activity for the school holidays. Here’s what we loved. 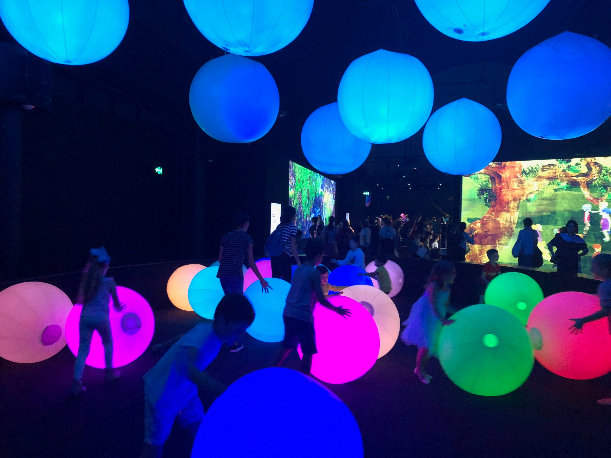 Future Park is an exhibit that brings imagination to life with colour, light and technology. 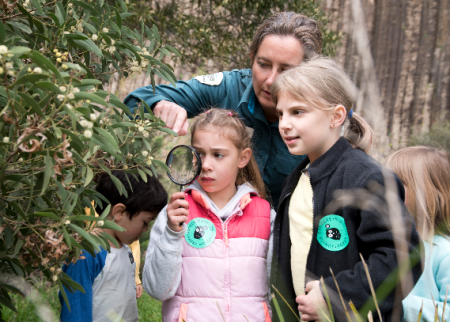 There are eight hands on stations for kids to explore, each one equally entertaining in totally different ways. Future Lab is a digital playground that the young and the young at heart will love. Be sure to book your tickets online and choose your session as Future Park is run in timed sessions across the day. The tribe loved the musical colour balls that change colour when you roll or bounce them. 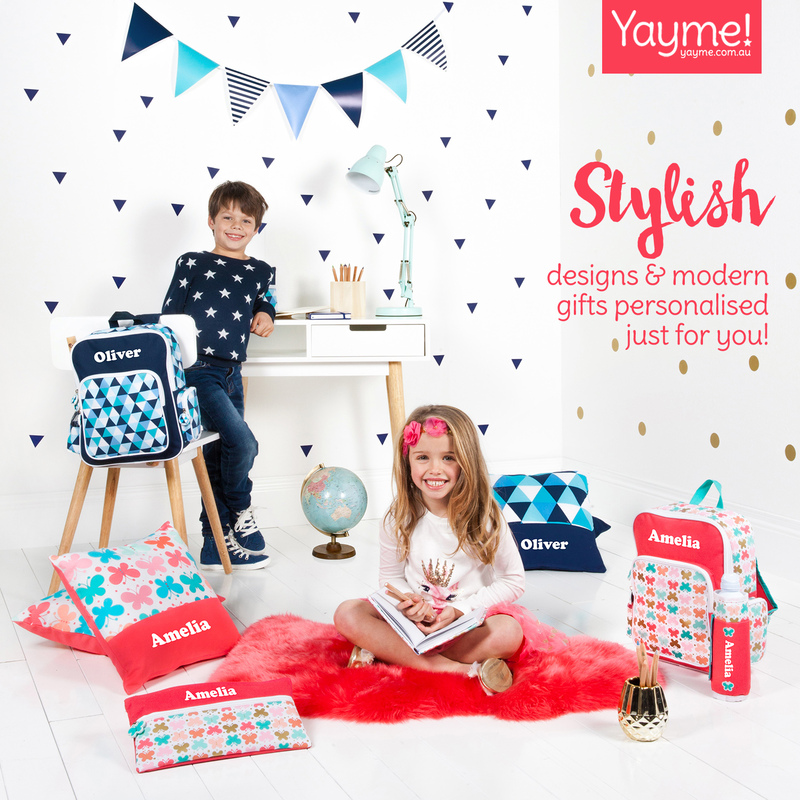 They are soft to touch and are enclosed in two areas – one for 0-3 year olds and one for kids 4 and up. The toddler area has smaller balls and a smaller space and ensures they don’t get trampled by the bigger kids with the large balls, but they don’t miss out on any of the fun. This was super fun for the whole tribe. There were templates for cars, planes, trucks, cranes, UFOs, houses, sky scrapers and more. The kids could take them to the colouring tables which were packed with crayons and colour and design to their hearts content. 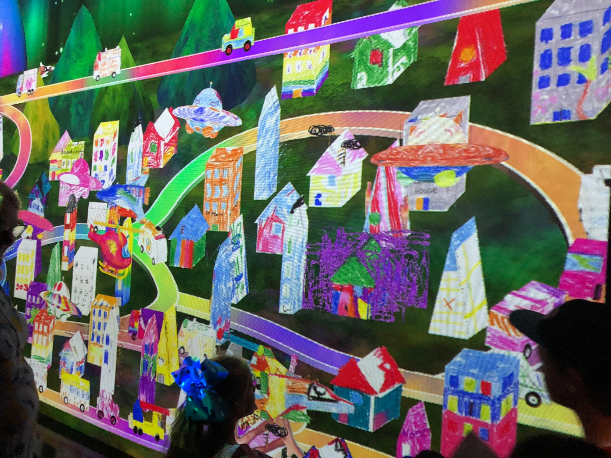 Once they had finished their artwork, they could take it to the scanning machine, scan their drawings and watch as they flew onto the interactive screen and became a part of the digital city. Similar to the futuristic city, the kids can design their own likeness and scan them into the park where they run and play with the other digital children, do tai chi and sit and relax in the park. There are other smaller interactive stations that are well worth a play. 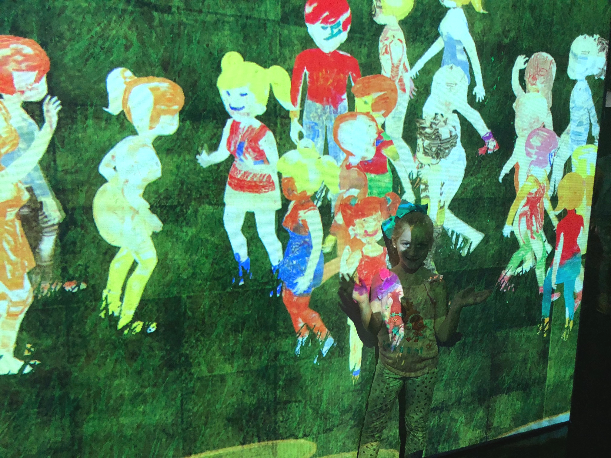 The kids can line up and jump and hop on a digital hopscotch that makes the imagery, artwork and music change depending on their steps. 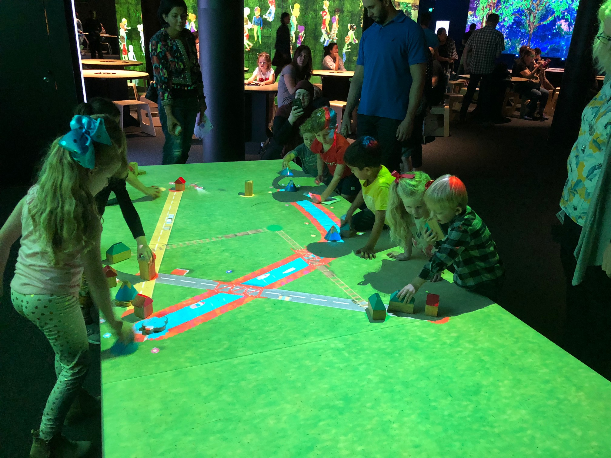 There is also a table with a digital eco system where the kids touch can create storms, sunshine, star bursts or make animals run around and climb. Another table creates train tracks and roads when you place the blocks into a sequence that connects them together. The kids loved figuring out how to interact with the exhibits to make them work. This exhibit was hard to get the tribe to leave. Climb up a steep slope in a light and colour spattered area and slide down the sides into the pit in the middle. 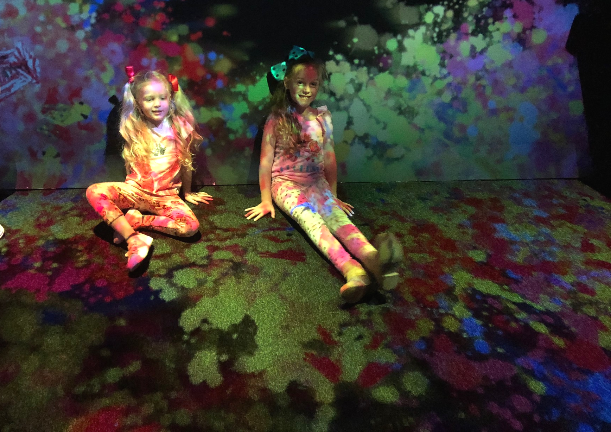 The kids were running around as the light and colour projected all over them and sliding down all of the different slopes back into the middle. There was artwork and a giant whale that appeared on the screens above and the tribe were completely immersed in this activity. Future Park finishes on April 30. Click here to see our visit on video.